Many years ago, in place of turkey I started alternating winter holiday dinners with rock Cornish hens. The Cornish hens tasted, well, okay--just okay but sometimes even dry. One year, I started basting the hens in the run-off juices of the butter and the hen. To my amazement, they were best rock Cornish hens I had ever cooked. A rock Cornish hen can deliver a flavor-filled taste with just salt and pepper. Add lots of pats of butter and then make a few extra efforts by basting it in its own juices. If you are not familiar with rock Cornish hens, they are not game birds. They are, in fact, hybrid boiler chickens and are always sold whole. They generally weight 1.10 pounds and have very little. There is another breed called Rock Cornish game hen which is a cross between a Cornish game and Plymouth Rock chicken breed. It weights around 2.2 pounds. 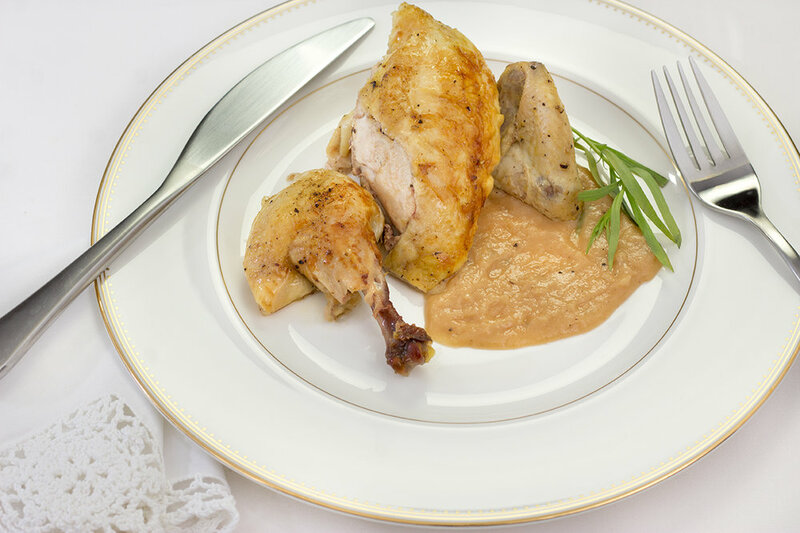 If you are lucky, you may be able to find a fresh Cornish hen but more often in grocery stores you will find them in the frozen section. Note that the cooking time increases per pound. Just be sure to check the label on the package for breed, weight and cookinig time. (This recipe is for a 1.10 pound rock Cornish hen. 1 or 2 - 1 pound 10 ounce rock Cornish Hen(s) If purchased frozen, unthaw overnight in the refrigerator. Remove any giblets from the inside of the rock Cornish hen. Thoroughly wash the hen. * Season well with salt and pepper inside and out. Fold the wing tips back under the wing drumstick. Tie together the ends of the legs. Place the Cornish hen in the baking dish. Add pats of butter all over the Cornish hen. This I consider key to cooking a whole hen or turkey so that it is done on the inside, as well as being brown on the outside: Cover with aluminum foil (sometimes referred to as a tent). Place the hen on the middle shelf of the oven and bake for 40 minutes. Remove from oven. 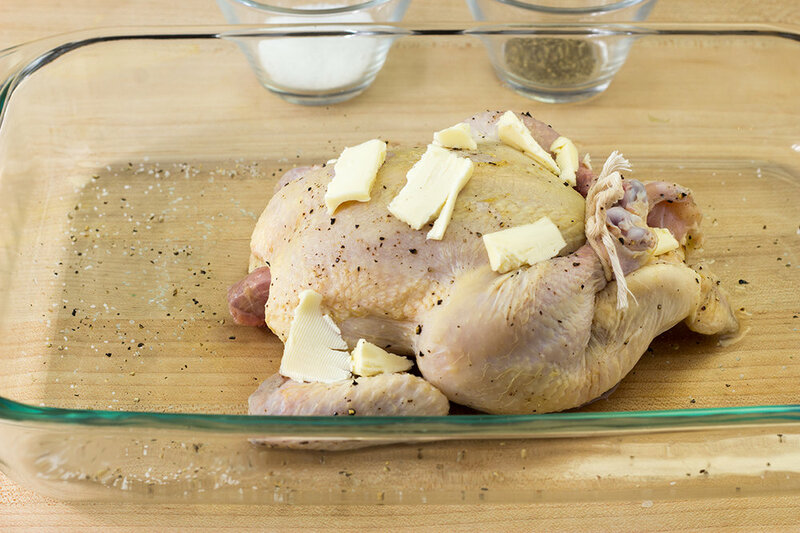 Using a spoon, scoop up any juices in the baking dish and evenly spoon the juices back onto the hen. Put the foil back on the hen. Return to the oven. Bake 11 minutes. Follow step #1 but leave the foil off when returning the hen to the oven. Remove from oven. Switch the oven to broil. Scoop juices back onto the hen. Place it back on the middle rack of the oven. Broil for approximately 4-5 minutes. After about 3 minutes, I strongly suggest you watch for browning to ensure it does not over brown. Remove from oven. Scoop a little of the juices onto the Cornish hen. Transfer it to a platter and allow to rest for at least 5-6 minutes. *On the washing a chicken or turkey, I'm from the old school--that is, my grandmother's kitchen. We always pulled out any pin bones and singed any pinfeathers over a flame on a gas range. Sadly, I now live in an apartment with an electric range. I will not describe to you how much I hate it!! Anyway, I am very careful to hand pull the pin bones and pinfeathers. I've even been known to use a big candle. For me, there is simply something very unattractive about a beautifully cooked bird with pin bones and tiny pinfeathers jettisoning from the wings and other parts of its body. Over medium heat, warm a heavy bottom sauce pan. Add left over juice from the Cornish hen and butter. Stir to melt and mix in butte. Add flour. Stir well to blend ingredients, about 5 minutes. Gradually add water while continuing to stir. If you want a thin gravy, add a little more water. Allow to simmer for about 5 more minutes, taking care that the consistency is to your liking. Add sufficient salt and pepper to your taste. Add tarragon sprig(s). Continue to simmer and stir occasionally for 5 minutes. Like this post? Let me know. Cornish Hen versus Turkey or Chicken. Stay in touch! Get post updates in monthly newsletter. however, credit and a link to anns-liee as the source MUST be included.